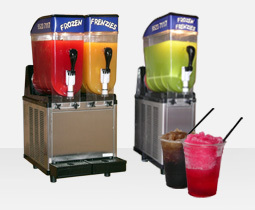 Our Frozen Frenzies drink machines are perfect for children's birthday parties, sporting events, fetes and Fund Raiser's. 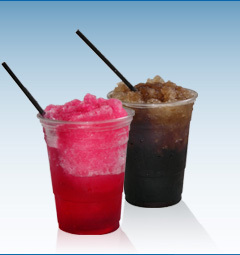 We have a huge range of flavours which include Raspberry Ice, Lime Freeze, Orange Crush, Blue Lemonade, Wildberry and Cola Crush. More flavours are available or we can supply fruit juice based flavours. We can leave backup mixture for your machine and you pay only if you use it. The cost for a 10 litre container of mixture is $20.00 inc GST which gives you approximately another 60 drinks. Plastic 200ml cups available to purchase at a cost of $5.00 inc GST for a pack of 50. Spoon straws supplied free. 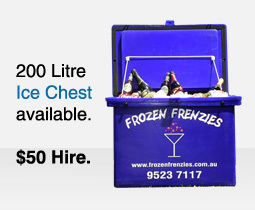 * Price is for machine hire pick up. For delivery, please request a quote when you make a booking. So go on... Make your next event the talk of the town! Book your machine now.